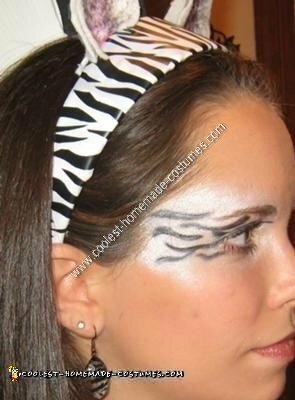 As an animal lover, I decided on a Homemade Zebra Adult Costume Idea for Halloween. This is a really cheap costume idea if you are tight on cash like me! I’ll start from the top. I bought a wide headband from the dollar store for $1 (big surprise I know). Then I covered it with white fabric that I had at home (taping it in place on the under side of the headband) and used electrical tape to make stripes on it (I found that the stripes are rather easy to make, especially if you look at a pattern online). Then I cut out a couple pieces of cardboard in the shape of ears and bent them a little bit, to give them the more rounded shape of an ear. I cut two little slits near the bottom of each side of the cardboard ear so that I could slide it onto the back of the headband. I also had extra cardboard on the bottom that I folded under the headband and taped to stay in place. I then glued white felt-like fabric to the cardboard ears and once again used electrical tape on the back of the ears to make stripes. For the mane, I used foam paper (you can find this at craft stores- they only cost a dollar per piece- I only needed one piece of black and one piece of white). I cut one long strip that I attached to the headband with tape. I then made slices down the middle of the long strip (with an exacto knife) so that I could insert the pieces that stood up into the slices. For the pieces that stood up, I left little tabs on the front and back to hold the pieces into the slices (I also used tape of the bottom to secure it in place better). I cut strips into the pieces that stood straight up so that it looked more like “mane” and not just chunks of black and white. This part took a lot of trial and error. At first when I did it, there were big gaps between each color. So I then cut more pieces (that were longer and rounded on the bottom to follow the shape of my head) and glued them with super glue to each side of whatever color I was working on. Then, to get the whole thing to lie flat on the back of my head, I used a bobby pin on the bottom that I attached to my hair and to the long strip on white foam paper. For my eyes, I bought white eye shadow ($2) and put that all around my eyes and then used black eyeliner to draw on the stripes. The earrings I found at Hobby Lobby (I believe the hooks cost $1 and the zebra striped earrings cost $1.50). The white tank top I owned and I added stripes to it with black electrical tape. Make sure you stretch the shirt out a bit (put cardboard in the shirt) while you are putting the tape on, or it will pull away from the sides a bit when you stretch it out and put it on. You can’t really tell in these pictures, but I also did my nails zebra striped. I bought white nail polish ($1.50) and used a sharpie to draw stripes on. Make sure your nail polish is very dry and hardened before you draw the stripes on. Also, make sure to put a clear top coat on top of the stripes or else they will start to wash away after a day. I attached the tail to black shorts with safety pins. The tail was made with rolled up white cloth. Then, once again, I put stripes on it with electrical tape. On the bottom, I added pieces of black yarn for the end of the tail and attached those pieces with more black electrical tape. The white tights I found on clearance for $1.50 at Meijer (girl’s section). I added my own stripes to the tights using a think black permanent marker. And last but not least, I wore my tall black high heeled boots. And there you have it! The zebra transformation was complete. I have to warn you, this costume took a lot of time and creativity, so make sure you are willing to put the effort into it before you begin! i love it, it’s really creative!